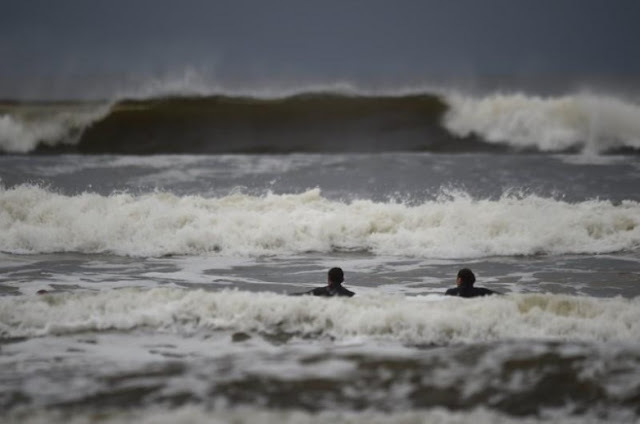 Surfers watch as waves approach in the Atlantic on the eve of storm Ophelia in an area where the tide should be out in the County Clare town of Lahinch, Ireland October 15, 2017. LAHINCH, Ireland - Tropical Storm Ophelia began to batter Ireland’s southern coast on Monday, knocking down trees and power lines and whipping up 10-metre waves, as the government warned the country’s worst storm in half a century could cause fatalities. Two people were seriously injured when a tree fell on their car in the southeast of Ireland, state broadcaster RTE reported. About 120,000 homes and businesses were without electricity with more outages expected and 130 flights were cancelled from Dublin Airport. Schools, hospitals and public transport services were closed and the armed forces were dispatched to bolster flood defences. The storm, downgraded from a hurricane overnight, made landfall after 0940 GMT, the Irish National Meteorological Service said, with winds as strong as 176 kph (110 mph) hitting the most southerly tip of the country and flooding likely. “These gusts are life threatening. Do not be out there,” the chairman of Ireland’s National Emergency Coordination Group Sean Hogan said on RTE. “Our concern is to avoid a situation where we have fatalities as a result of the extremely destructive and violent gusts that we are expecting,” he said. Hurricane force winds are expected in every part of the country, Prime Minister Leo Varadkar said, advising people to stay indoors. “While the storm in some parts of the country is not yet that bad, it is coming your way,” Varadkar told a news conference. Britain’s meteorological service put an Amber Weather Warning into effect for Northern Ireland from 1400-2100 GMT, saying the storm posed a danger to life and was likely to cause transport cancellations, power cuts and flying debris. “Impactful weather” is expected in other western and northern parts of the United Kingdom, it said. British media are comparing Ophelia to the “Great Storm” of 1987, which subjected parts of the United Kingdom to hurricane strength winds 30 years ago to the day. The centre of the storm was expected to move across Ireland during the day before moving towards western Scotland overnight. The Irish government said the storm is likely to be the worst since Hurricane Debbie, which killed 11 in Ireland in 1961. The storm is likely to pass close to a west of Ireland golf course owned by U.S. President Donald Trump, who has been planning a wall to protect its greens from coastal erosion. Similar sized storms in the past have changed the shape of stretches of the Irish coastline, climatologists said. Tropical Storm Ophelia began to batter Ireland’s southern coast on Monday, knocking down trees and power lines and whipping up 10-metre waves, as the government warned the country’s worst storm in half a century could cause fatalities.